Noy and I had the driver drop us off at the T1 area in Tondaligan Beach. 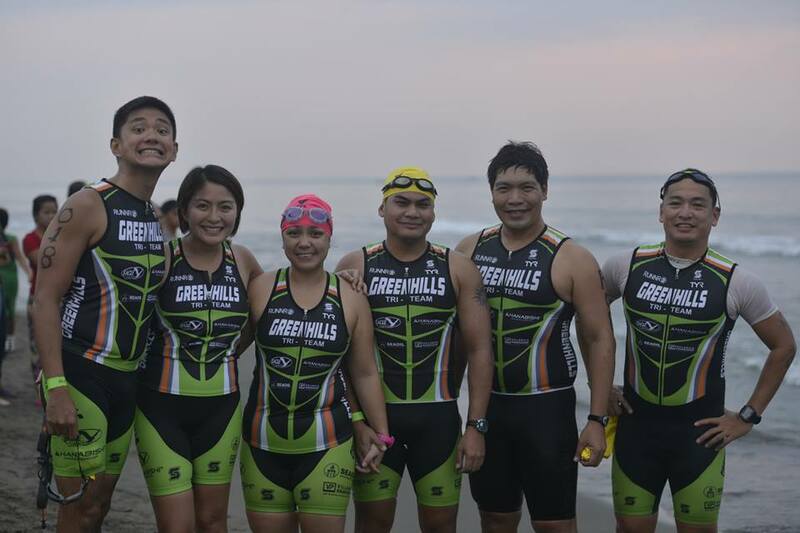 We met up with our GHTT teammates Doc Art, Doc Eric, Shai and Dennis after we prepared our bike and gear for the race. 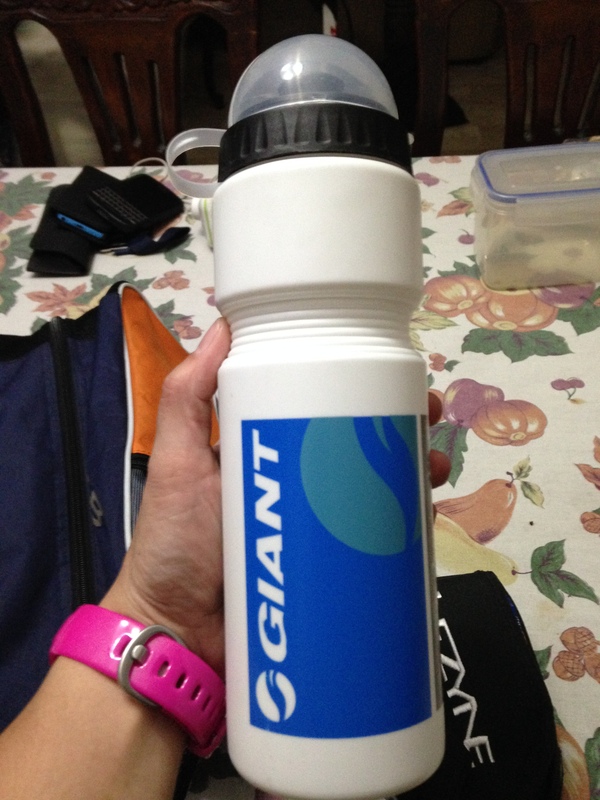 The organizer said that they had ample hydration stations so I decided not to bring any extra water bottles in T1. A mistake which I will explain later. I was expecting the water to be calm as it was just 6 in the morning but it didn’t look like it at all. 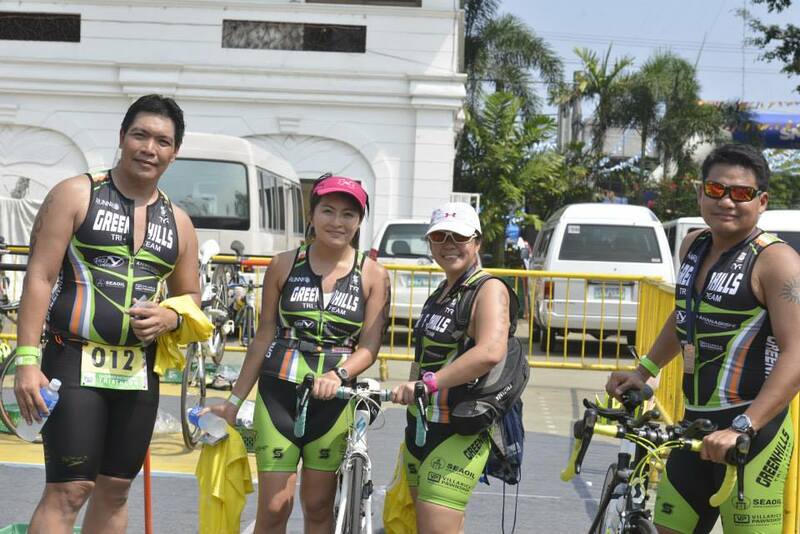 I remember Coach Nonoy telling us to warm up and test the water before the race itself so we did just that. Waves were strong at the first part of the course but later mellowed down after about 100m. I could see some of the participants were close to panic. Deep inside I felt scared too. I couldn’t see anything. Not the person beside me, not the sand beneath the water. I could however, make out the shape of the lane line. Whew! The things I loved about though venue though were – there were no rocks, no corals, just sand; the water was shallow; and no sea love bites and jellyfish! Yay! Initially, there were three waves. Since the event generated just about 150 or so participants (which in my opinion is a decent number), they decided to make it into just two waves. Standard and relay wave 1 and sprint for wave 2, as far as I can recall. 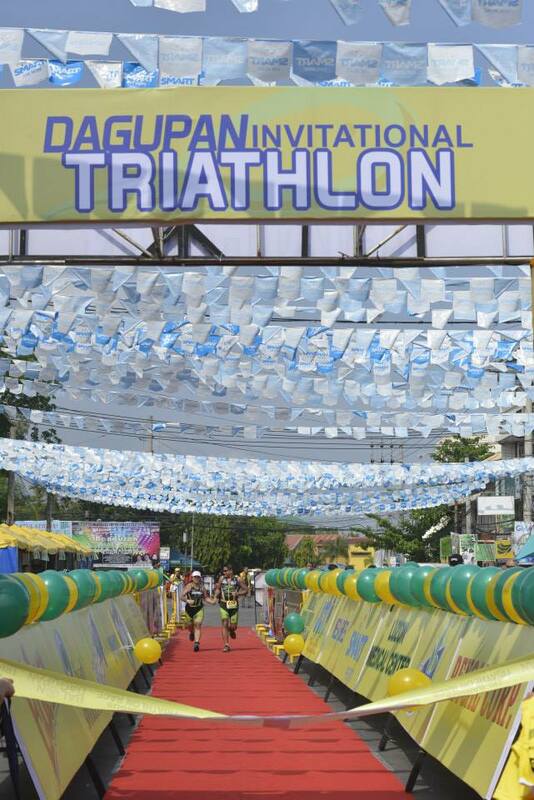 The local government of Dagupan was very supportive of this race. Even Mayor Belen Fernandez herself graced the event and even said a few words. 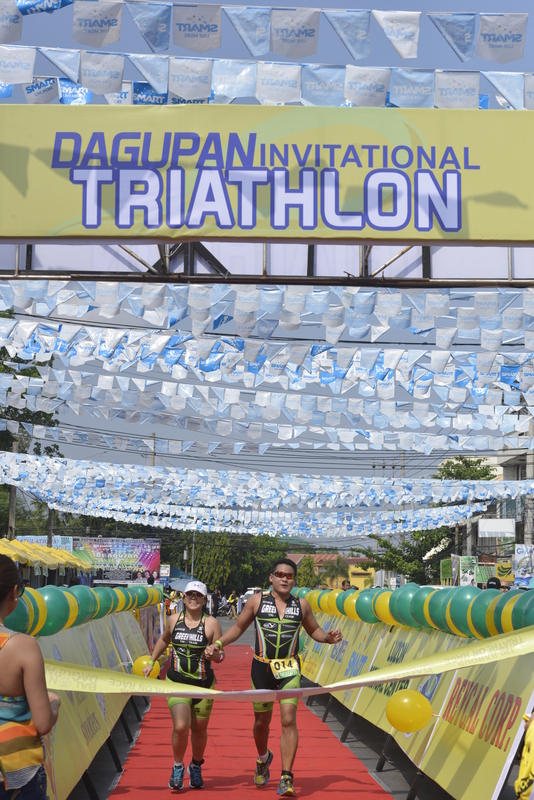 My grade school classmate – Karlos Reyna, a Dagupan City Councilor led the countdown to the gun time of the first wave. 3, 2, 1 and we’re off! The swim event was composed of two loops of 750m. Compared to my swim in TU1, I put more effort into this event. During the first loop, I noticed about 5-6 male participants holding on to the buoy and another one asking the lifeguard for a life vest. I guess they got scared of the waves. I finished my 1st loop in 12 mins. Impossible I said to myself and continued on to the next stopping for a drink of Pocari Sweat. This is where I had issues. My goggles were leaking so I had to swim with one eye closed for a time. After fixing it, it happened again. Argh! What a major hassle. I was out of the water in 26 mins. Again, I said to myself, I couldn’t be that fast as I headed to T1. Remember the extra water bottle I failed to bring? Big mistake that I didn’t prepare one. I needed to remove sand on my feet and the fastest manner would be the pour water over it. I did it in TU1. How could I forget it this time? Tsk tsk. I was out of transition 1 is less than 4 mins. Too long in my opinion. I got myself new Speedplay pedals which I hated for a time and learned to love after awhile. The problem with Speedplay pedals is that it is hard to clip on. It takes a fairly good amount of force. I felt close to giving up on it but eventually after about 30 (or so) tries, it finally loosened up and I was able to clip on using much lesser force. Tip: when trying to clip on your cleats to the pedal and it doesn’t happen immediately, just continue to pedal and fix it along the way. Better than trying to clip in while balancing on your bike without momentum. You tend to fall that way. Believe me. This has always been my problem. Haha! As soon as I got on my bike, I started my “catch up with Noy” program. Noy’s a way faster swimmer than I am. He can finish a 1k swim in the pool in 20mins or so. I assumed that he was ahead by about 6mins. I shifted to high gear and started my program. The route would take us through Arellano avenue right towards AB Fernandez Ave (Downtown area) and left towards De Venecia Hway. It was so surreal biking along the “downtown” area. It was closed to traffic so we had it all to ourselves. I passed the City Plaza where the finish line was, passed Eternal Gardens where my dad, grandparents and aunts are buried and passed our ancestral home, where I grew up. A lot has changed. I started to feel emotional but quickly stopped myself as I continued on to look for Noy. 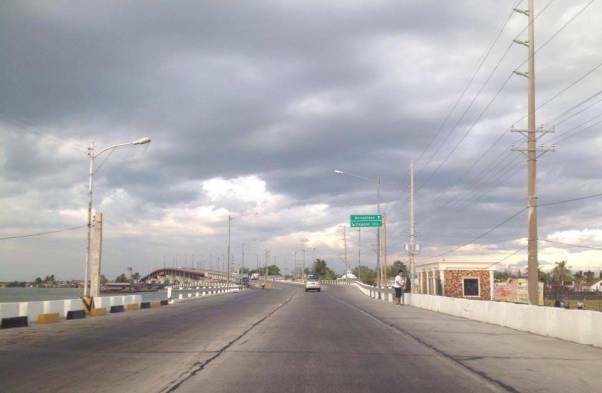 To complete the 40k ride, we needed to do four loops along De Venecia Hway with Arellano Ave at one side and CSI Stadia on the other. We would need to climb a bridge along this Hway 8x! Eeep! It’s not a bad climb but it’s still challenging for me and to do it 8x sounded like a daunting task. I was pleased to find out that there were ample hydration stations along the bike route. Not that I needed it. I had my dependable camelbak on 🙂 They were even giving away Giant bike bottles! Too bad I didn’t have an extra bottle cage. Hehe! Finally I saw Noy. I inched my way towards him until he was only ahead by about 300-400m. 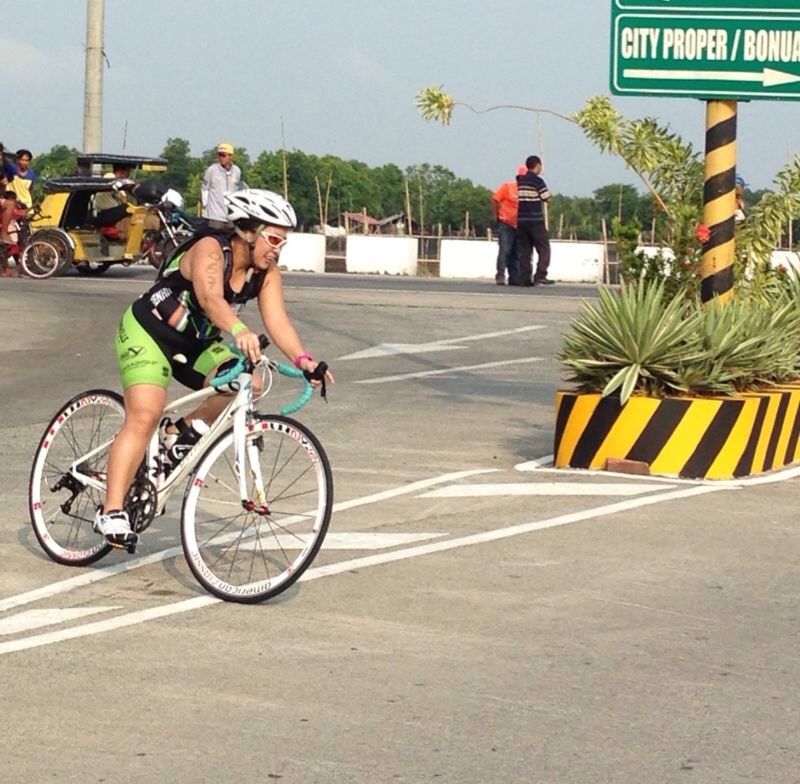 Finally done with my loops, I exited the course and headed towards T2. Finished in 1 hour 10 minutes. But I noticed that the bike course was short by 500m. T2 was located by the finish line. It took me just over a minute this time. I had a nagging feeling that I had forgotten something. But I pushed it back as I pursued Noy. As expected my legs felt heavy but I knew that I could overcome it after a few hundred meters. 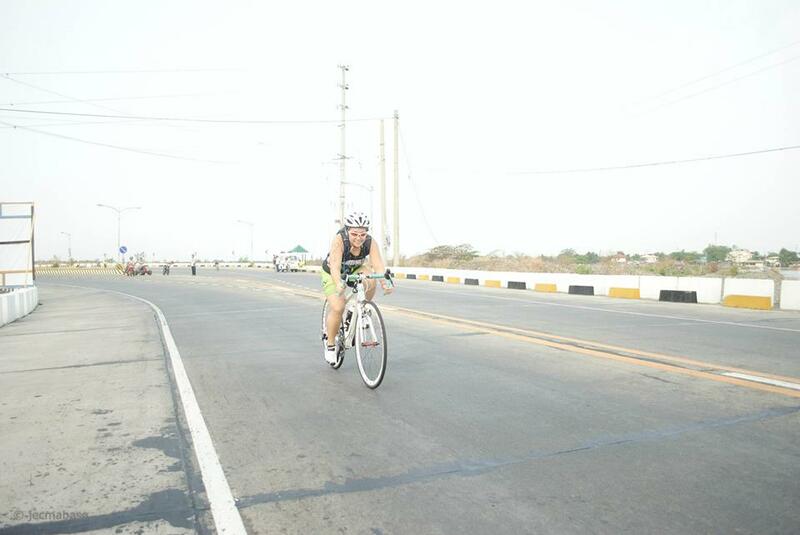 I finally saw Noy as he took the first turn around point about 200m away from me. The run course was composed of 4 loops before heading towards the finish. Halfway through the run, my legs have not recovered. What in the world was happening? And my body felt odd like it was so weak. Then I remembered what I had forgotten! My nutrition! The last gel I consumed was before the swim and without breakfast and a very light dinner, I was close to bonking. Yikes! Less than 2k to go, I felt it. My most dreaded feeling, a cramping leg. But I pushed myself to continue forward. I could see Noy stopping to get a drink, less than 100m away. Almost there I told myself. Finally, the last stretch. 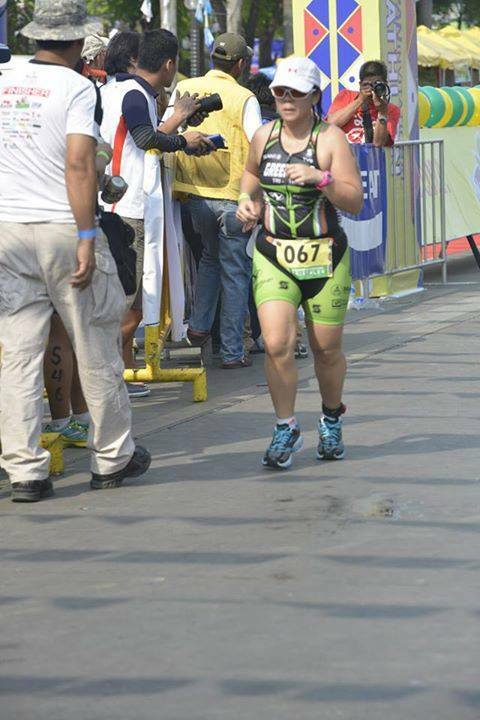 Noy was less than 50m ahead and I was in pain. 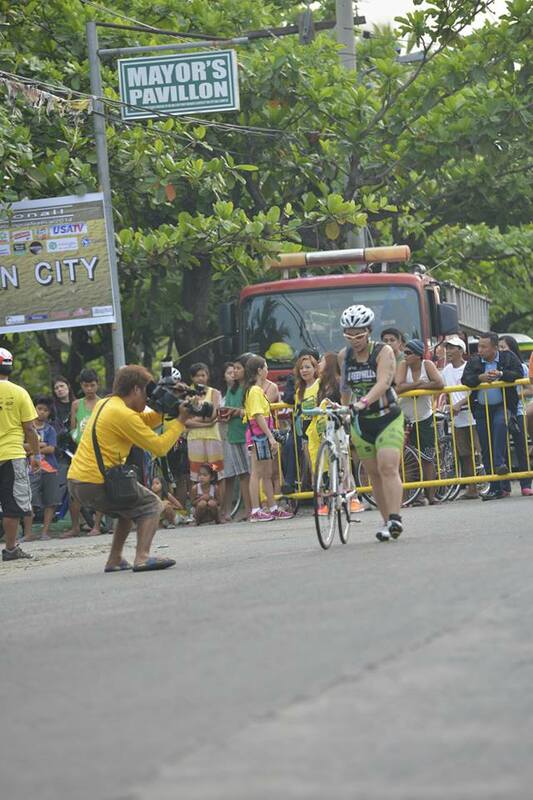 Before entering the chute towards the finish line, he stopped, turned towards me and waited for me to reach him. He held my hand and we ran together to the finish line! Noy asking me how I was…So sweet! I was exhausted! I didn’t even notice that someone placed a medal on my neck. I did however notice this overly enthusiastic marshall eagerly removing my timing chip from my cramping leg as soon as we crossed the finish line. Geez, talk about in a rush! Haha! Good job Caryang and Karlos! We didn’t hang out anymore for the post race buffet. I heard that there was so much food! Darn! I enjoyed myself immensely! 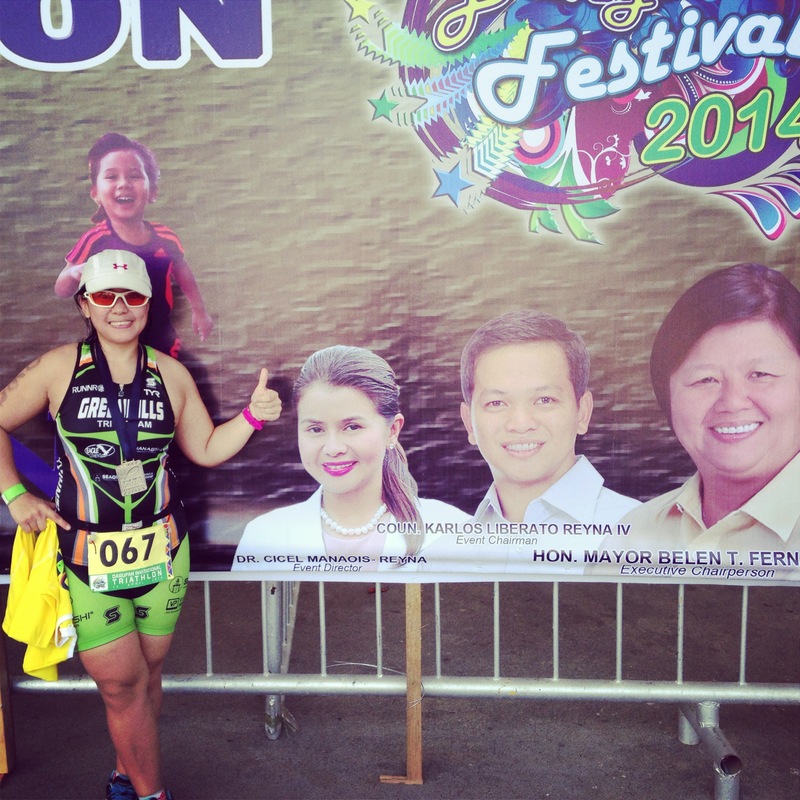 This race was well-organized, well-attended, well-priced and super festive! 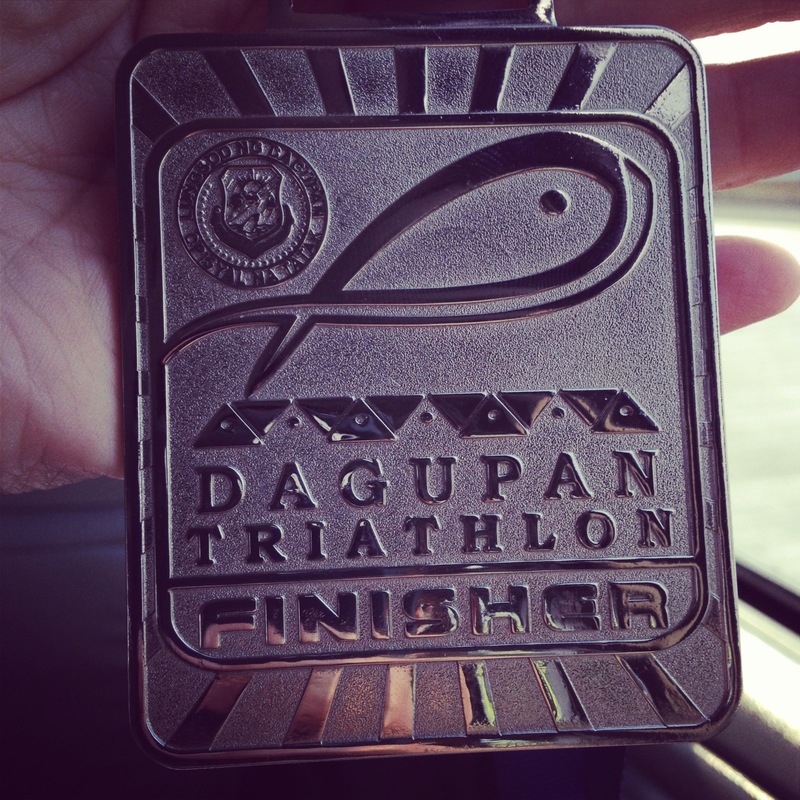 Proud to be a Dagupeña finisher!